The newly formed "Tea Party Caucus" met today for the first time to discuss its platform, goals and purpose amidst the backdrop of a growing national movement. Twenty-four congressional members met on Capitol Hill with Tea Party members from different ethnic and social backgrounds to address their concerns about a government they claim has stopped listening. "There's probably been, in this last year and a half, no more interest in any group other than the Tea Party because they represent mainstream American people who have decided to get up off their couch because they want to take their country back," Tea Party favorite Michele Bachmann (R-Minn.) said at a press conference after the meeting. Among the featured guests were two immigrants from Latin America, a retired army veteran mother of five, and members of the Tea Party spanning from Potomac, Maryland, to Seattle, Washington. They each expressed a similar wariness of large government and high taxes. "I came here for liberty, and didn't come here for dependence. I came here for opportunity I didn't come here to receive from the government or be told by the government what I should do or what I shouldn't do," said Tito Munoz, an immigrant from Columbia. National Coordinator for the Tea Party, Jenny Beth Martin, said the three major principles of the movement include no higher taxes, no deficit spending, and a government that acts within limited constitutional boundaries. Members scoffed at the assertions of racism or extremism and tried to distance themselves from what they call "fringes" in the party that garnered that reputation. 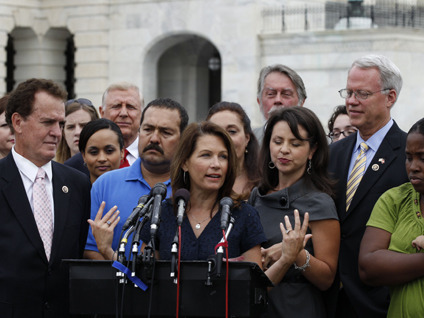 Bachmann filed the paperwork to form the Tea Party Caucus last week and there are currently 28 members. Rep. Mike Pence (R-Iind.) is the only top member from House Republican leadership that's joined the caucus so far. Joining the Tea Party Caucus would put leaders in an awkward position of embracing a platform that they could not necessarily control. But Bachmann says forming the caucus is complimentary to other GOP efforts to interact with regular Americans. Caucus members asserted that they will not be a mouthpiece for the Tea Party organization, but instead exist solely to listen to the concerns of the people. Bachmann said she hopes the caucus can be bipartisan and has reached out to Democrats in the House. Jill Jackson is a CBS News Capitol Hill Producer. You can read more of her posts in Hotsheet here. You can also follow her on Twitter.